All classes for all levels at Tamilcube Learning Centre (MOE Registered) are offered through our unique Tamilcube GOLD™ (Game-based Overall Learning Development) Program. This program ensures that the children learn Tamil language skills quickly and easily through group activities and games in a fun-filled environment. In addition to traditional classroom teaching, this program effectively utilises the benefits of modern digital and online technologies. Tamilcube GOLD™ Standard: A small group environment suitable for a child with normal language maturity level and strives to achieve further progress rapidly. The class size is limited to a maximum of 8 children. Tamilcube GOLD™ Premium: Suitable for a child that needs more individual attention. The class size is limited to 1 to 3 children which ensures his individual language development needs are well taken care of. Tamilcube GOLD™ One: One-to-one class customised for individual student’s learning needs and pace. Tamilcube GOLD™ Online: One-to-one class conducted through Skype. It saves the student’s traveling time and allows him to attend the class from his sweet home. View the video below to know more about our Tamilcube GOLD™ program. This video is based on our promotion being aired by MedeiaCorp’s Oli 96.8 Radio. Thanks to Jaynesh, Shamini and Bala for their lovely voices. Do you want to know how Tamilcube GOLD™ was featured in Mediacorp’s Vasantham Tamil News? View the following videos. 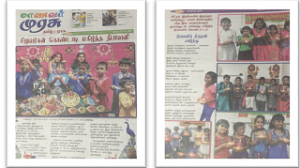 Tamilcube GOLD™ was featured on the first page of Tamil Murasu (Manavar Murasu) Newspaper.